With April almost upon us we look forward to spring fishing here off Fort Lauderdale and Hollywood Florida. But our winter has been pretty good compared to the last 3 years with a mix of some Shark, Sailfish and Dolphin activity. While the winter time is our most productive time of year for Sailfish, this year was better than recent years. Not in the numbers we like to see and certainly not consistent but we’ve had a good showing, especially recently. At this point in time, we’ll be seeing these fish moving both directions in their migration patterns as opposed to south in the winter. Believe me, there’s nothing more exciting that getting one of these on your line, even for guys like me who have been doing this for years! I chose this picture of the Sailfish because it shows the entire fish. This particular fish was 87”. If you look closely, you’ll see a clear tube which feeds the fish we boat seawater to help them survive as we measure and tag them before their release. Preserving our fishery is very important to us and we do this with most boated game and sport fish. No matter how well you plan a fishing trip it doesn’t always work out the way you might think. 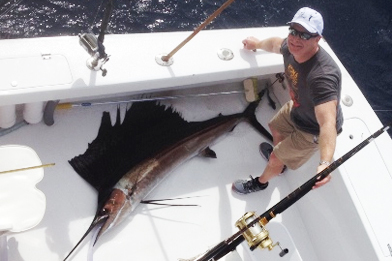 While most trips aren’t set for a specific fish, our Swordfish fishing trips kind of are. Swordfish are the target as to the distance we have to travel to get to the grounds. But there are plenty of other fish along the way. Our nighttime trips are pretty much just Swordfish as we travel out as the sun sets. 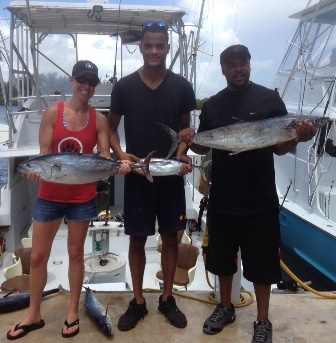 But the daytime trips can offer Dolphin, Wahoo, Tuna and Marlin on the way to the grounds. It is also nice to be able to see the fish you’re catching whether you are bringing him up from depth or having him strike from the surface. Daneane got to see her fish coming in, a Dolphin weighing about 8 lbs. Once we reached the Swordfish grounds, our first drop got no attention. Fishing in such deep water on the bottom poses all kinds of problems and it takes touch to know your bait is in the right position. Our electric reel tells us how much line is out and that first drop had over 2500’. We gave it 45 minutes, retrieved it and reset a little deeper. The second drop was down about 30 minutes when a bump was felt. With all that line out, that’s about all you see too, just a bump. Was he there? Had he eaten? Sean began bringing the bait up and it slowed a few times, even took a little drag out. I think we’ve got one!!! The counter was now at almost 5,000’ of line out and we were dealing with about 3 knots of current. This fish was also pulling much harder than most swordfish which meant either he was a huge one, foul hooked or maybe something else. We would find out just over an hour later. The weight was up and off now and we still had over 150’ of line out, all leader now. Slowly the line kept retrieving and finally some color was seen. It took another few minutes before we could identify our Thresher shark and realize he was foul hooked in the dorsal fin. So while we did not catch a Sword this trip, there were no unhappy faces aboard as we watched this fish swim lazily away and down. And a fine dinner was provided by the Dolphin in the box. With Christmas almost upon us and our busiest week of the year after that, I thought I’d fill you in on what’s been happening with our fishing recently. With some rather gusty winds and sporty seas, fishing has been pretty good. Sailfish and Mahi-mahi have been the most prevalent fish around lately, some being caught on the troll but most being caught with live bait. 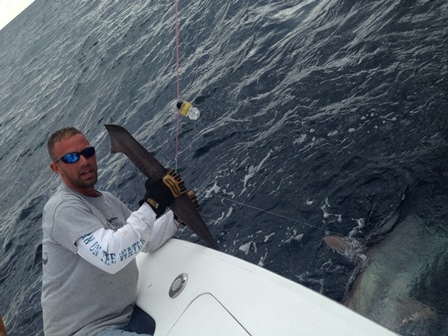 Fishing with kites has been the most productive in water from 80’ out to over 300’. And multiple hook ups are not uncommon. 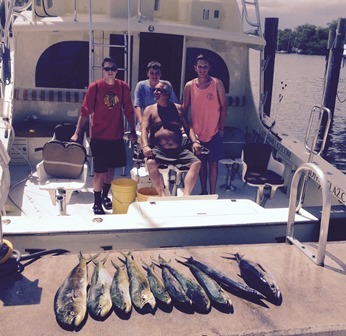 The Mahi’s have been mostly schoolie size, 5 to 12 lbs. with a few bigger ones as well and the Sailfish have ranged from small to huge, no telling what will bite. But that’s part of the game. Scattered Kingfish on the reef are with a few nice ones being taken by live bait as well as some small Tuna and Bonitos. Bottom fishing has been tough as of late because of the windy conditions. I always include a picture with my reports and today is no different. While not a monster to most, this young man caught the largest fish of his short fishing career, a 15 lbs. Wahoo that’s almost as long as he is tall. And it is that beaming smile upon his face and the pride of his father that has me choosing this picture. For almost 40 years I’ve been guiding folks to memorable trips at sea for fishing and it is these pictures that are most dear. So in what will be my final report of this year, we at Fanntastic Fishing wish you a very Merry Christmas and a Happy New Year. May we ALL prosper and catch LOTS of fish! Today was a GREAT day for our first fishing trip since returning from the Bahamas. 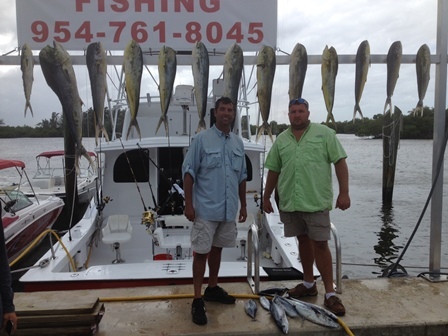 Our 6 week trip standing by the Emerald Express at Crooked Island did not offer us much chance to fish. But with Peter and Jamie coming from Fort Meyers for their all day fishing trip, we began the day early and the action never quit. With high winds and heavy seas we pushed out the inlet and began trolling by the sea buoy at Port Everglades. Our first pass netted us a strike as Sean was putting out the shock cord for one of the deep lines. This shock cord connects to the planer except… It wasn’t connected yet. LOL Peter had to hand line in the first fish, a nice sized Mahi-mahi. Well, not a bad start. As we pressed on another fish, then a second hit, now both anglers were hooked up again with Dolphin. We trolled for about another 3 hours, never seeming to go more than 10 or 15 minutes without some kind of bite, the fish coming in 1 or 2 at a time, as we moved north against the current and wind. Grey skies finally began to let some light through and we opted to try some live bait and flying the kites. After splashing 1 kite in the water while trying to launch, we finally had a few baits up on one and a small shark came by. Not what we were hoping for but fun none the less. These sharks are only about 2’ long and there are tons of them around right now. But a Sailfish or Big Dolphin was what we wanted and we reset the bait. A few more Dolphin were caught, another shark or two as well. And as a rain storm approached and we had to bring the kite in, the boys said they were done. The box full of fish was plenty and no one was looking forward to getting wet. So with a little over an hour left to fish, we came home early, missed the storm and spent the next hour or so cleaning fish for the guys. It truly was a great way to return to our dock from that long trip. 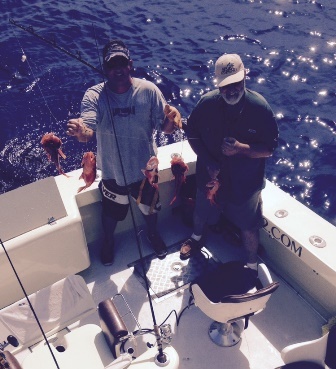 Yes sir, fantastic fishing off Hollywood! Dolphin fishing off Fort Lauderdale hasn’t been great the last few years but this year but this year has been different. Summertime fishing used to be mostly fishing for Dolphin out in the deep, it was their time. These last few years saw the Dolphin coming much later in September, October and even later toward winter. But this year we’ve had some good luck anywhere from 4 to 15 miles from shore as it was on out trip the other day. Gerard, from Chicago, brought his group of three boys out for an all day trip. As we began at the reef trolling in hopes of a few Kings or Bonitos, Gerard made it clear he’s much rather be out in the deep looking for some Mahi-mahi. We had all day and some reports were finding some weed so why not? And off we went. While the big line was about 14 off, we started finding some nice patches around 8 miles off the beach. Our first big patch had us slow down and put the gear out and a bite came right away! But getting the boys up was a struggle, apparently they had been up late and we ended up missing that fish. Fear not, more were to come. Another pass got us a nice sized Blackfin Tuna and then 6 or so small Dolphin but only one keeper. Still the action was welcome. We continued on searching patch after patch. It seemed we never went more than 15 or 20 minutes without getting a hit. Some were so small, they had to be tossed back but our fish box was getting fuller with each new patch of weed. A small Wahoo was also caught from under a crate we found. While we still had some time, the boys had had it and we headed in a little early. We ended up with 8 or so keepers out of 25 or 30, the biggest being about12 pounds or so, the small Wahoo, the nice sized Tuna and a few Bonitos we’d caught before coming out. I’d thought Gerard was ready to cook up a feast but he said he just wanted to catch them and Darin and I reaped the reward. Had the Mahi last night for dinner by the way, it was excellent! Tuna tonight! With generally calm seas and light winds this area has been saturated with seaweed. Sargassum is a branchy type seaweed and is home to all kinds of small creatures like brine shrimp and other small species that provide food to bait fish which… attracts larger fish like Dolphin. While the weed has been so thick it is almost impossible to fish through, it has offered us some of the best Dolphin fishing we’ve had all year. Many of the fish have been small and were thrown back but small legal sized schoolies as well as some larger fish in the 20-30 pound range have been taken. It sure is nice to come in with some of these to clean for the table, both our guests and our own tables. While the reef area in close to shore has been slow a few Kingfish and Bonitos are being caught. But the Bonitos should be here in force and they are not. A valuable bait source for the charter boats, we need these fish to make our strip baits. We look forward to their return soon and you’ll enjoy the fight they give, at least for a while. Our bigger game fish have been hit or miss. We’ve had some success with Sharks and a few Sailfish have been being caught late in the day, not unusual for this time of year. And while our most recent Swordfish trip did not net us a Swordfish, the boys had a blast filling the box with the Dolphin we found on our way to the grounds. Can’t wait to try again! Bottom fishing has been very good. 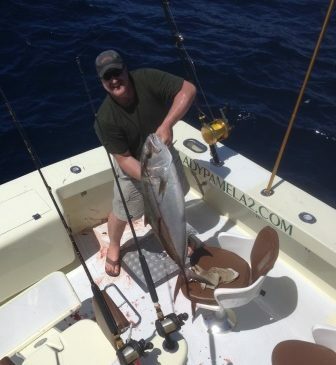 Large Yellowtail and Mutton Snapper have been in the reef area close to shore while the deeper wrecks are producing some good fishing with Amberjack, Grouper and even a Cobia or two. But a recent group of guys were so worn out from catching the Dolphin the day before they requested some bottom fishing. Deep drops for Blackbellied Rosefish were our target in very deep water that require use of the electric rod and reel. Bringing fish up 900’ by hand is excruciating and once we got on them? You can see in the picture they were biting as we were bringing them up 4 and 5 at a time. While the Dolphin will provide many meals from the day before, these Rosies will be a special treat! We’ve been busy getting our NEW Buddy Cannady 47’ Sport Fish boat ready for service. Just another week or two and we’ll be in service. And then maybe I can be more prompt on my fishing reports for the Fort Lauderdale/ Hollywood area. 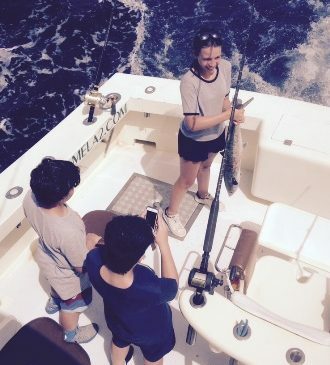 With summertime in full swing these days, Fanntastic Fishing is seeing more kids on board our fishing trips. Long days and no school bring the local, as well as the tourist, families out in droves. And the GREAT thing about fishing with kids is their excitement over each and every fish that is caught. Summertime fishing brings the Bonitos to our area. Not great table fare for sure, but excellent fighters and plentiful. It’s not unusual to catch a dozen or so of these fish fairly quickly and usually more than one on at a time. The early morning and late afternoons will have them attacking the tops baits. As the day wears on, they move deeper and hit the deep lines when trolling. The Kingfish are also plentiful this time of year, if the Bonitos will allow them to get a bait or two. They range in the 8 to 10 lbs. class but some bigger ones can be caught on both dead and live bait. They don’t pull quite as hard as the Bonitos but can be eaten. The smaller the better and always should be eaten fresh, within a few days. Since trolling is our norm this time of year, wahoo, Dolphin and the occasional Sailfish are also possible. When the clean ocean waters come close to shore, these fish can be had just a few miles off the beach. Venturing further can be advantageous if you can find weed lines or floating debris. These offer the fish off shore a floating reef for protection. The Dolphin are generally small this time of year and many don’t meet the minimum requirements. But Dolphin are the fastest growing fish in the ocean and today’s throwbacks are tomorrows keepers. Our larger game fish like sharks are becoming more and more scarce. Evening trips are the best time for these fish and can be found in shallow waters not far from shore once the sun goes down. But this is fishing and there’s always a chance during the day for a Hammerhead, Thresher, Dusky, Sandbar or Bull shark. Bottom fishing has been productive with small Snapper and Grey Tilefish. It takes a lot of cranking to catch these fish in 300-400’ of water but you bring them up in numbers, usually 3 to 5 each time. The days that only one comes up makes it a little tough but the meal at the end is worth it. And there’s always a chance for a Grouper to pass by and bite. The picture I chose of this young girl was our trip the other day. The kids were young and did struggle with the rods but she beat her brother and cousins by claiming the largest fish caught. This Kingfish was more than enough to feed the entire family and was cleaned and taken to the restaurant next door for dinner. The rest of the fish that were caught were left for bait. The Bonitos provide us with strip baits we use throughout the year for trolling. Summertime fishing trips at Fanntastic Fishing can be loads of fun, especially for the kids. Bring lots of water… It’s hot out there, but not as hot as shore. 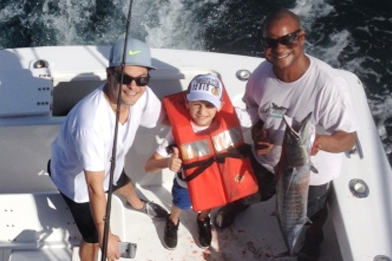 Private charter fishing trips are the main type of trips we sail in the winter months but all year long we offer what is called a split or shared fishing charter trip. These trips are put together with people that are traveling alone or maybe as a couple and don’t want to spend the money for a private charter. In the summer months here in the Fort Lauderdale/ Hollywood/ Miami area, this is usually the case and type of trip we run. A few Bonitos, we expect more to come, some Kingfish, small Dolphin and Tuna were our fish of the day. The Dolphin were too small to keep but were photographed before being released by those that caught them because of their vibrant color. 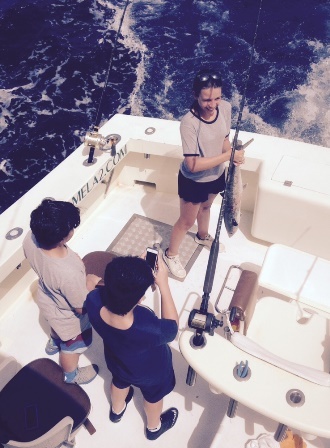 In less than a week they will be big enough to keep but they are somewhat educated now… A couple of nice Kingfish in the 10-15 pound range, a Huge Bonito with a regular Bomber and a nice Tuna made our group quite happy. 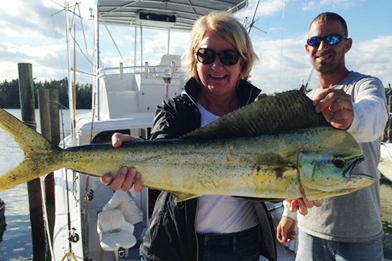 While a high percentage of our guests are men here in Fort Lauderdale, there are some ladies that also like sport fishing or just fishing in general. Today’s trip was a group of gals that were far from the ordinary. Bachelor parties are somewhat common but bachelorette parties? That’s what was in store for us this afternoon when Chelsea and the girls showed up. Most were from the Carolinas and one was from Texas. They had their food and beverage, which included an ample supply of beer only proving that they know how to fish and we were off and on our way or a fun afternoon. As Joe was putting out the lines our first strike came right away. The bride to be, Chelsea, was given the first fish and it turned out to be quite a fish! Her first Sailfish was on the line and jumping! Because only a few baits had been put out we had little to retrieve and were backing down quickly as Chelsea took in the line. And within 15 minutes, we were able to get a picture of Chelsea and her prize. We quickly found out that these ladies were all about fishing. How did we do this or that and can I hold my fish… And winding? We had to ask a few of the girls to slow down some so they didn’t pull the face off the fish! Even after just a short time, the girls were beating Joe to the rods and setting their own hooks. And some bantering between them all as the fish kept rolling in.